Tissue grafting and organ transplantation are common techniques in modern medicine, but suffer from the widely-reported limitations of constrained supply and the risk of rejection, necessitating a lifetime of immunosuppressant medication . The field of tissue engineering has advanced markedly over the last decade, and engineered tissues are under development for both regenerative medicine applications as well as the formation of accurate in vitro models for the study of fundamental tissue behaviours, disease states and drug discovery. Both biological and synthetic materials have been formed into cell-supporting tissue scaffolds  and . In broad terms, biological materials and particularly extracellular matrix (ECM) components offer superior cell interaction properties, but are challenging to process . Synthetic materials are readily processed, but may lack specific or necessary cell interaction motifs. The fabrication of truly biomimetic regenerative scaffolds is an incredibly complex challenge, one that requires an integrated approach to both biomaterials and biofabrication technologies . Recent advances in additive manufacturing and bioprinting technologies have made it possible to combine a diverse array of biomaterials and cells together into complex and functional 3D tissues . These technologies typically rely on “bio-inks”, processable solutions that support cells during printing and enhance survival, proliferation and function of cells within the printed scaffold  and . Hydrogel forming biopolymers have shown particular promise as the major component of bioinks. The scaffolds formed from such materials have adequate internal structure (porosity) and diffusion rates to exchange nutrients and waste materials with the surrounding medium, allowing cells to organize in a tissue-like manner , , ,  and . More importantly, their chemical, optical and physical properties can be modified and tailored to match printer and tissue requirements ,  and . The ARC Centre of Excellence for Electromaterials Science headquartered at the University of Wollongong is involved in the development of innovative bio-inks and bioprinting technologies. This issue's cover image shows the results of some of this research: a 3D depth profile showing cortical neurons within a 3D printed structure. The print was obtained using a “bio-ink” composed of a polysaccharide gellan gum (GG), purified according to methods detailed in Kirchmajer et al. and RGD-modified using the protocol detailed in Ferris et al. . Prior to printing, we harvested cortical neurons from embryonic mice (E15–E18) BALB/cArcAusb obtained from Australian BioResources (New South Wales) in accordance with the Animal Ethics Committee (AEC, #13/04), University of Wollongong. Once isolated, cortical neurons were dispersed in DMEM and mixed 50:50 with 1% (w/v) RGD-GG in Milli-Q H2O at 37 °C. The biopolymer/cell suspension was patterned using a novel hand-held bioprinting technique developed by our group and reported in . Printed gel/cell composites were maintained in Neurobasal media (Gibco), supplemented with 1% l-glutamine (Sigma), 2% B27 neural supplement (Gibco) and 1% penicillin/streptomycin (Sigma) for 7 days. Cells were then fixed and immunostained using rabbit anti-GFAP (Millipore) and mouse anti-β-III-tubulin (Covance) antibodies and secondary antibodies Alexa Fluor 488-conjugated donkey anti-mouse, Alexa Fluor 594-conjugated goat anti-rabbit (Invitrogen) alongside DAPI-labelled nuclei (Molecular probes). Images were taken with Confocal microscope Leica TSC SP5 II (LAS AF version 2.6.0) using the XYZ acquisition mode and displayed using the 3D projection tool of the β-III-tubulin channel. The resulting colour coded images represent the fluorescence intensity of this channel across the numerous z-stacked layers. 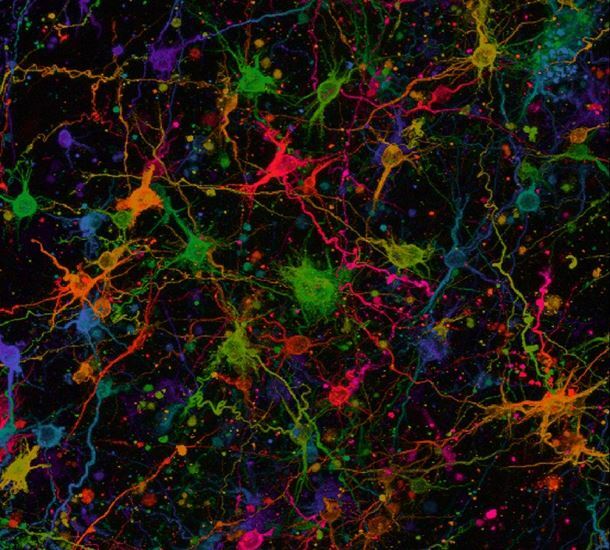 Colour is assigned to each layer based on z-position in the gel, and the highly colourful image presented here demonstrates that the cortical neurons are distributed in three dimensions throughout the RGD-GG gel. In conclusion, the survival and differentiation of primary cortical neurons in 3D printed RGD-GG modified hydrogels has been demonstrated. The large amounts of interconnected neurites that are visible in the image demonstrate that the neuronal network is highly developed. This indicates that the bio-ink is providing a highly favourable environment for the development of a neural model. The printing process therefore offers the opportunity to develop more accurate in vitro brain models that could be applied to study neuronal cell behaviour, leading to an understanding of brain injuries and neurodegenerative diseases. The bench top printed structures should also provide a tool for assessing the efficacy and gaining insight into the mode of action of new therapies. The authors would like to thank the Australian Research Council for Centre of Excellence Scheme (CE140100012) and Australian Laureate Fellowship Scheme (FL110100196) funding, as well as the Consejo Nacional de Ciencia y Tecnologia (CONACYT, Mexico) for financial support of the first author. The authors thank the Australian National Nanofabrication Facility – Materials node for provision of equipment. The authors have no financial interests to disclose.